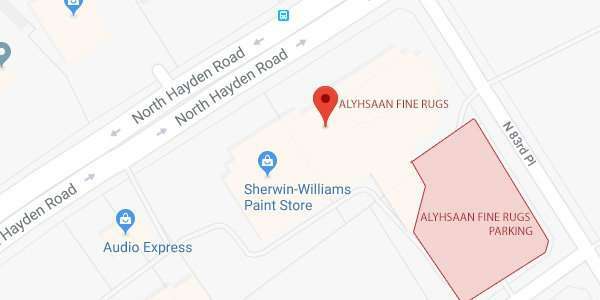 Why Choose Alyshaan Fine Rugs? Alyshaan Fine Rugs, located inside Scottsdale Design Center, has the largest and finest area rugs inventory in the Phoenix Valley. We have over 5000 fine handmade rugs including Persian, Antique, Oriental, Tribal, Modern and Contemporary rugs woven purely with wool and/or silk. For difficult sizes or colors or for a room that requires something special, we have the best custom rugs program in the country. We provide a drama and gimmick-free atmosphere and have the highest quality area rugs at the best prices with the ultimate in service and guarantees. We have a certain degree of pride in how well we have been reviewed over the years. With stellar reviews from Google, Houzz, and Yelp, you can be assured that you will receive the best in service. At Alyshaan, we want your rug shopping to be a magnificent experience. At Alyshaan, we are a three-generation family business. What began with my father’s dedication and love for artfully handmade rugs, is now carried on by my son, myself and a highly talented staff of 9 people. Welcome to our family. At Alyshaan, we have always believed in working with a social conscience. By choosing to look consciously at the process of the making and trading of our product — from the sheep that provide the wool, to the workers who weave and finish the product, the entrepreneurs who make it happen, the methods and materials used our hope is to inspire others to follow suit and make our world a better place. Need an unusually shaped rug for closet room? No worries, we can create almost any shape for your custom rug. Looking for some fine area rugs? Alyshaan Fine Rugs specializes in fine handmade area rugs. There’s not a better place to get rugs in Scottsdale as we have the incredible inventory of over 4500 rugs. The best custom rugs service in the USA. Despite our incredible selection, there is always an opportunity to build a design that is precisely your own. We have looms in India and Nepal and can build small area rugs as well as huge palace size rugs. Thank you for all your patience, good taste, and insightful judgment in the recent selection of rugs for our home. The entire experience from selection, to delivery and now in post-delivery service has been flawless, as well as enjoyable. You stand alone in customer service and are truly the “Ritz Carlton” of home furnishings here in the valley. Thank you for the beautiful rug!! We love it so much. We will be back for more!! Excellent–this is the first rug of this type that I have bought in Arizona. Will definitely buy more from you. THE LARGEST SELECTION OF FINE AREA RUGS IN ARIZONA. Start browsing over 5000 fine rugs from your computer, phone or tablet today.